When we talk about health coverage at any age, it’s easy to assume that whatever plan you have will cover the entire cost of any medical expenses you incur. The truth though, is that many plans don’t provide you with complete coverage. You may have to pay a portion of your expenses out of pocket. With that truth, it can be scary for some, especially those approaching retirement. Not only are you living off your retirement plan and savings, but you also have the added expense of medical coverage, likely through Medicare, and having to pay any additional medical expenses not covered. Part of your retirement plan should include budgeting for not only Medicare, but for your health in general. To help you out, here are a few tips that will be beneficial when it comes to budgeting. If you’ve had consistent medical expenses throughout the years, those are likely to continue with you into retirement. You want to have a monthly average of what you spend on prescription medication and any doctor appointments needed. This number will help you decide which Medicare plan is best for you. If you don’t have any medical expenses right now, that isn’t to say you won’t have any in the future. Start researching what some of the standard medical costs for those in retirement as some may eventually apply to you are. Medicare can be confusing. There are many different plans the cover only certain parts of your health. Part A encompasses hospital visits, inpatient rehabilitation, nursing and hospice care facilities, and some home health services. Part B covers both inpatient and outpatient care, ambulance services, some hospitalization, clinical research and some medical equipment. Part D is for your prescription drug coverage. There is a deductible you must pay every year for both Medicare Part A, Part B and Part D. That deductible could change each year (the 2017 deductible for Part B was $183). On top of that, there are your monthly premiums for your plan, and depending on your income, and when you enrolled, that could increase your premium. There are also Medicare Supplement Plans to help fill in any gaps of your coverage. These plans are in addition to your Medicare coverage and help to cover any additional out-of-pocket expenses you may incur. You’ll have to factor in the different Medicare Supplement rates as well. Even with your Medicare and Medicare Supplement plans, there could still be out-of-pocket expenses. For example, most plans do not cover long-term care. They may cover portions or up to a certain amount, but there will still be some expenses left up to you. Those costs can add up very quickly. Consider any vision, hearing, or dental care that could be an issue down the road. You cannot guarantee that all plans will cover these additional expenses, meaning the cost will fall on you. 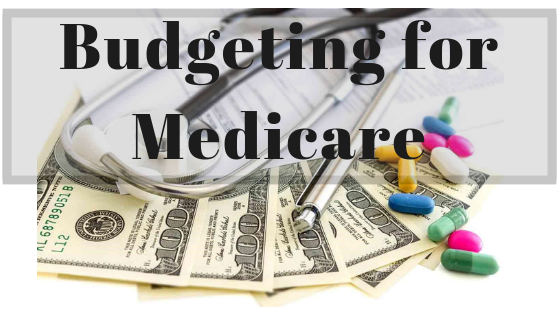 So, how do you budget for Medicare? It’s best to err on the side of caution that you’ll have additional expenses not part of your coverage. The more you can have set aside for medical costs, the better off you will be.